It was July of 1954. Elvis Presley had just made his radio debut in Memphis with “That’s All Right [Mama]”, DC Comics launched a new Superman-family book with Superman’s Pal, Jimmy Olsen, and Batom Comics published its first comic book with what can only be described as a nervous pride. Their comic was born at the nadir of a shattered comic book industry, and featured a genre that would have been a tough sell even in the comics heyday. The book was Starbuck Jones featuring the exploits of the star spanning space opera hero. The character was the brainchild of Batom Comic’s first official writer Flash Freeman. It was a witness to Freeman’s belief that science fiction deserved a home in the comics. Answering an ad in the Cleveland Press, Freeman showed up on Batom Comics doorstep to find the brothers Barry and Thomas Martin high on enthusiasm to begin publishing comic books, short on experience in how to produce them, and desperately in need of stories to fill them. Freeman had been a stringer for the Press as well as a freelance writer for various publications around town, but his dream was to be a writer of short stories and novels. And not just any short stories and novels. Freeman was fan of science fiction, a field still in its youth and brimming with a nascent energy and excitement. Heinlein, Asimov, Clark – these were the stars that Flash Freeman saw when he looked up to the heavens. For some reason, however, SF had never fully transitioned into the comic books and sales of the genre remained low. Martin Goodman the publisher of Marvel Comics had once famously proclaimed that he never wanted to see a comic book that had rockets, ray guns or robots on the cover. Still, Flash Freeman’s enthusiasm for stories set in the cosmos convinced the Martin brothers to make Freeman’s stellar hero, Starbuck Jones, the star of their first published comic book. Freeman’s belief in his character was contagious. In Freeman, Thomas and Barry had found the writer who knew how to make a successful science fiction comic book. They were going to need someone to illustrate the stories and once again luck was with them. Freeman had reached out to Phil Holt an artist he had worked with from time to time on his various freelance jobs. Part illustrator, part cartoonist, Phil was the perfect artist for the job. His clean exciting style set the tone for the series right out of the gate. He worked up a character sheet for Starbuck Jones and as soon as the Martin brothers saw it they were sold. The first issue laid out Starbuck’s origin. He had once been a member of a group called the Lunar Cadets, but his issues with regimentation and his tendency to freelance on missions led to his becoming a freebooter of sorts. A Lone Ranger of Space as Flash Freeman referred to him. A mercenary for hire for the right cause. 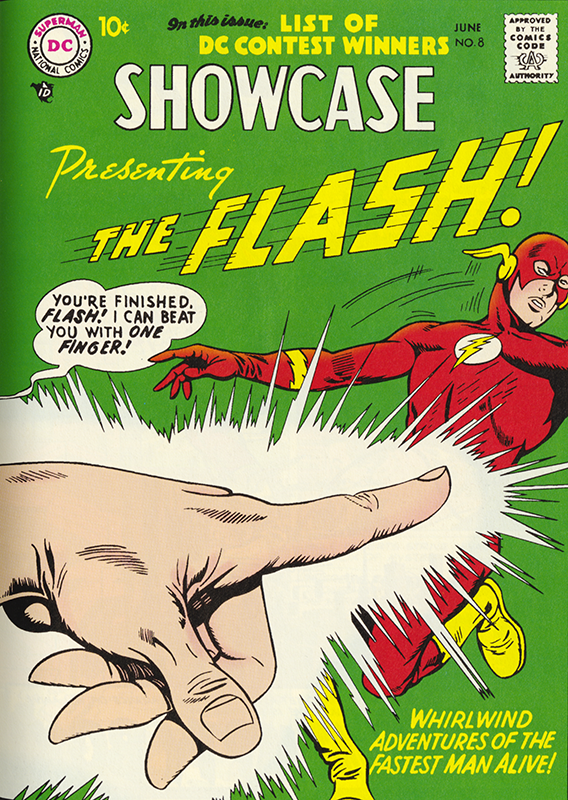 Flash poured all of his pent-up pulpish energy into that first issue, and Phil Holt ably brought the characters to life and breathed life into the characters. That first issue also introduced the Xaxians the alien race destined to become Starbuck’s arch enemies. But all of it would be nothing but space dust if that inaugural issue wasn’t a success.